Btw - due to shrinkage on my (Above) Sakrete sand mix (yeah I know), I had to 253R skim virtually the whole pan. Wait 3 hours for it to set up and then Kerdi. Too late to set tile so effectively I lost a full day. Lesson learned. Will use a mix that won’t shrink next time. Just an idea that might eliminate any concerns on the Houston mud method. 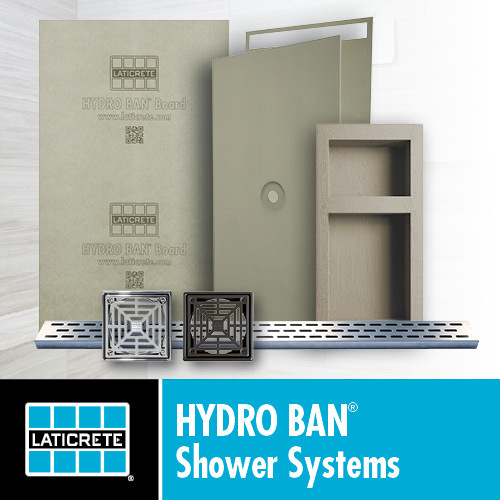 Next time you/someone take(s) out somebody’s frameless glass shower door, although it’s expensive and time-consuming, you might consider making a sample box as big as a sample shower and silicone or urethane it down to the glass. Then do your wetting for what you think is appropriate based on volume, and then snap some shots from underneath. Just to make sure/confirm that the water percolated all the way down to the bottom. We assume that it does, but without seeing it you can’t be totally sure. Kevin - try Laticrete nxt patch for skimming surface...it sets up within half an hour or so in most cases. Thanks, you’re right of course. I have bags and bags of Uzin 888 & 886 patch in storage but thot my in-hand 253R would go off faster than planned. Real answer would have been a better mud mix. I've thought of the clear box idea, but was concerned about capillary action along the acrylic giving a false impression. Building one then breaking it apart would be a better test. C'mon Paul....you can do one and post it.....! I have a 6' x 8' shower to do on Monday. Got the slip sheet and the lathe stapled down. I figure about ten bags of 4 to 1 should do the trick. Oughta be good to go on this "Houston Mud Method." Just finished the above mentioned Kerdi shower. The next day, the floor was hard as a rock. Put in the Kerdi and band & corners and am good to go. I'm an "old time mud man" who still floats his shower floors with dry pack. For the life of me I see no advantage in doing it any other way. I respect Paul, and through the years I've recommended him for work in the Houston area. Just don't like the so-called "Houston Mud Job." I remember seeing Paul's method years ago on here. Never heard anything about it since. Can't believe he's still using it. I'm with John, I see no advantage to this method. There's just no way misting the surface of dry mortar is going to be effective in properly saturating the mud. I find it quite effective. Use the amount of water the manufacturer specifies, and sometimes a tad more till the surface is slick and/or beads up slightly. Done a number of them and they came out fine. My normal order of operations has the floor mudded after the walls are waterproofed with foam panels. We band the mud to the walls the walk all over the drypack floor while tiling the walls, which normally takes a few days. Those days of foot and ladder traffic would expose any flaws in the drypack. I would think the mud would hold up fine without flaws but I just don't think you're saving that much time. And if you're using 4 to 1, you're spending about twice as much as sand and Portland would cost. But, I also see the convenience of premixed mud. I use a lot of bagged wall mud for the same reason. The main thing I don't like about this system is the risk of flooding a ceiling when using it on an upstairs shower. All it will take is flooding one ceiling, I think you know what I mean. I would just make sure the felt paper or plastic seals up good at the drain to keep the water from getting by it. I'm not much of a risk taker and would rather spend a little more time to avoid a possible problem. I get a lot of repeat work from folks. If I flooded a ceiling, that would be the end of any work from them or their friends. I'll charge a little more and take the extra time. But, to each their own.